As usual, whatever Israel fails to impose by war, it tries to achieve by means of the subsequent agreements, and the reconstruction of Gaza agreement under the supervision of the UN is no difference. It is the manifestation of international complicity in not only solidifying the siege, but also using it to eliminate the resistance, using the UN as a cover. The expected competition over bids, which are subject to Israeli veto, opens the door wide open for, not only Palestinian and international warlords, but also to the main Israeli companies at the expense of the affected families. These companies always take a significant share of the profits, as they deal with importing construction materials to the besieged Strip. We all know what is going on. It is a repeat of the reconstruction process of Gaza after the 2012 war, but with new restrictions that allow Israel to gather detailed information about Gazan families and institutions and to have the process of rebuilding the homes destroyed by the bombing subject to Israeli supervision. Hence, Israel can disrupt or completely hinder reconstruction. 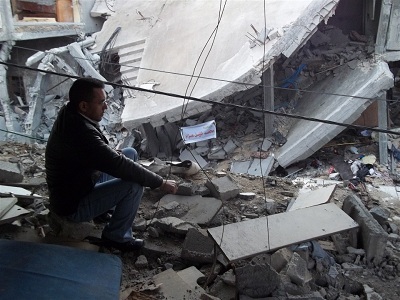 According to the agreement signed by the Palestinian Authority and the United Nations, the reconstruction of housing in Gaza is subject to inspection and monitoring according to specific conditions, including “Israel’s security considerations with respect to the use of building materials that have ‘dual uses'”; i.e. materials that Israel suspects may be used to build rockets or explosives, and these materials may include cement, iron and plastic, according to Israel’s contraband list. It is clear that Israel wants to use the “reconstruction” process to not only firmly root the blockade under UN sponsorship and through the PA, but also as a means by which Israel can punish the people of Gaza. This is possible because, based on the monitoring and inspection permitted by the agreement, Israel can prevent the reconstruction or repair of any Palestinian house, building, or institution which it accuses of being affiliated with or affiliated to a resistance faction. The clause regarding compliance with “Israel’s security considerations” is not only dangerous due to Israel’s control of the process, but also because the UN and the Palestinian committee overseeing the reconstruction will be employed by Israel to gather intelligence information about every family and residential and commercial neighborhood in Gaza. Thus, the reconstruction process will be turned into a legitimate spying operation with an Arab and international cover. Mark Regev, spokesman for Israeli Prime Minister, said Israel’s aim in gathering information and retaining veto power to prevent the entry of construction materials or the reconstruction of the Strip is “to prevent Hamas from rebuilding the infrastructure of its military power,” especially the tunnels between Egypt and the Gaza Strip . But, Israel may not need to impose a veto on the construction, as the United Nations can do so, because the existing mechanism in the convention is committed to the implementation and application of the United Nations itself “against terrorism”, especially on large projects, including schools and factories, although Israel had tried to start the application on homes and apartments. This means that the UN practically goes by the Israeli definition of Palestinian resistance, i.e. that they are terrorist organizations and therefore implicitly acts as a tool to hit and eliminate the Palestinian resistance. All of this is happening in public, with no objection, neither from the Palestinian Authority, which is the main party in the agreement, nor from the rest of the Palestinian factions, including Hamas. What we are witnessing is a global Israeli blackmail operation and the exploitation Gaza’s destruction and the suffering and tragedy of its people. There will be no reconstruction of Gaza unless the blockade is tightened and without subjecting Gaza to Israeli security consideration and there will be no consolation for the martyrs and the wounded. Why, given all that, did Hamas agree to a cease-fire? Did it really think, post-Guernica II, that Israelis would be fair, compassionate, etc.? The UN and PA can keep delaying things so long that Gazans, living in misery, simply move out….ceding the land to Israelis.